Green roof planting media must provide a stable structure to anchor plant root systems, nutrients for plant health and lightweight to prevent excess loading of the roof structure. These manufactured soils vary in composition, but typically include lightweight aggregate and mature leaf compost. Design standards for modern green roof soils were developed in Germany, beginning in the late 1960s. Green roof construction in the US has been accelerated in recent years, in part, thanks to the reduction of stormwater runoff from buildings with green roofs which helps meet new EPA stormwater regulations. 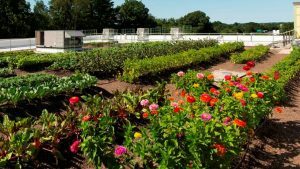 Read Custom Soils has been manufacturing lightweight soils for green roof since 2001 and has provided the planting media on most green roofs in New England. 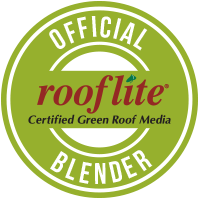 We are the authorized regional blender of rooflite® Certified Planting Media and we are the exclusive contract blender for several major green roof manufacturers. Click on the rooflite badge for detailed product information. We can deliver any volume of green roof planting media in bulk, SuperSacks or small bags throughout the region. Reduce heat island affect and provides valuable natural habitat in urban area.